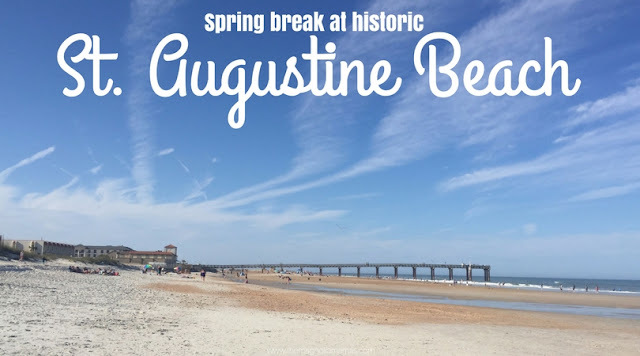 This week I am chatting all about Spring Break in St. Augustine Beach. Yesterday was all about our arrival and Day 1, and today is about Day 2! Looking back on our trip I realized how much we packed in in just a few short days. 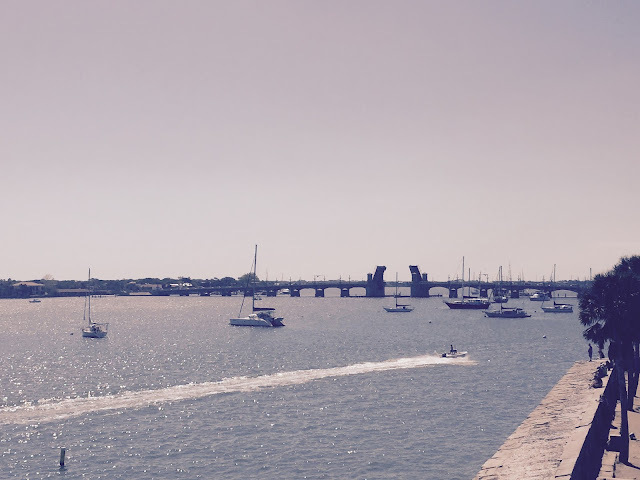 There are SO MANY things to do in St. Augustine. When the weather wasn't warm enough to pool or beach it, there were tons of options to choose from to entertain everyone. The mornings were a little on the cooler side, so my game plan each day was to do an activity and wait for it to warm up, and then spend the rest of our day poolside or playing on the beach. 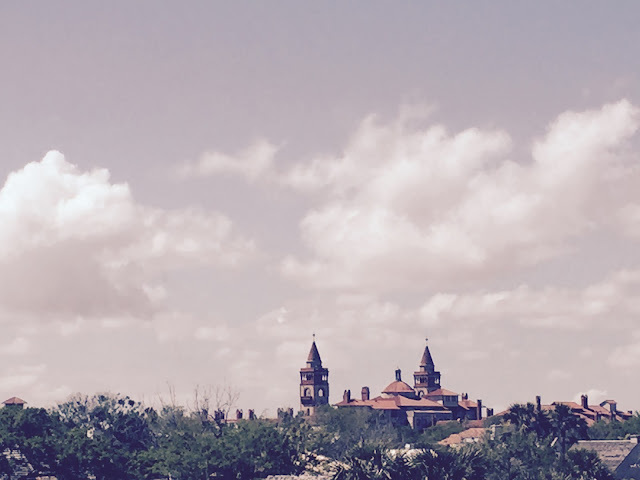 On Day 2 we made our way down to Historic St. Augustine. It was about a ten minute drive from our hotel, and has tons of things to just within a few blocks. 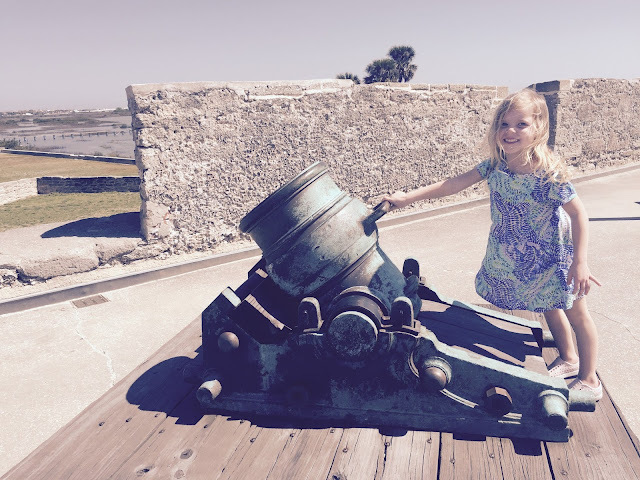 I had read there were a ton of forts in St. Augustine dating back to the 1500's. I knew my kids would something like this, and I feel like these are typically loose in terms of tours and the ability to explore on your own, which with three young children is just what I needed. 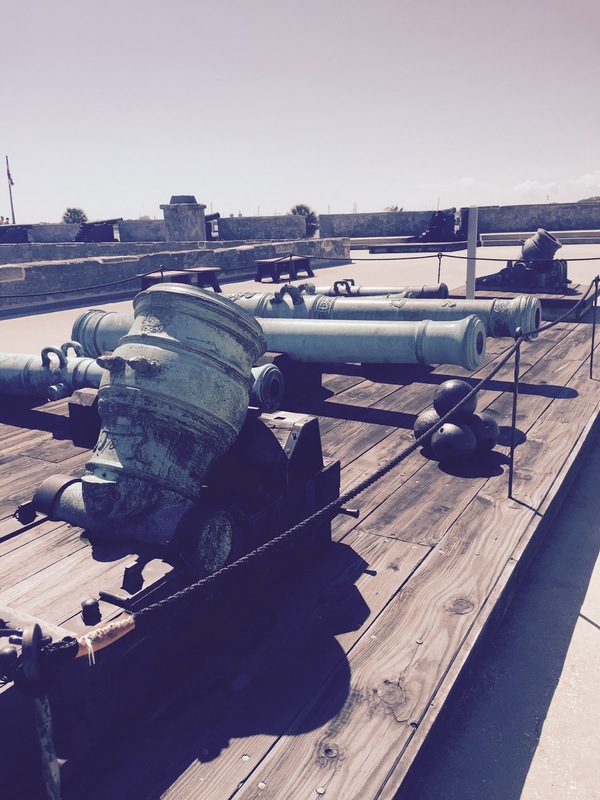 Castillo de San Marcos is the oldest existing fort in the United States, and is located right in the heart of downtown historic St. Augustine. It spans over 20 acres, and has tons of areas that you can interact with. It's incredible to see how it has stood after so many centuries and to see what the soldiers did to entertain themselves. On almost all of the walls are messages, drawings of boats, or dates. They have people walking around dressing up in attire from different time periods of the fort's reign explaining different parts of the fort and what it's functions were. There are also several rooms on display to showcase various officers and their rooms and what their fort life was like. Once you've made your way around the lower level of the fort, you can make your way to the top of the fort. The views up there were incredible, and I can see why it was a good location for a fort because you can see clearly in every direction for miles! I apologize here for a bit because somehow one of the kids switched my phone to some crazy filter. So our pictures have a little old school touch to them. The kids also loved this part because you can see all the different kinds of cannons the forts used. It was so neat to see! And while I was a little nervous chasing a busy, climbing obsessed toddler around with some of the lower walls, it made for a fun time. The kids loved the fort. There was a ton of historical content, but there was enough to entertain them, and the fact that we could explore on our own I think allowed for us to spend more time here. We spent about two hours walking around and checking everything out, and only left because the toddler was about to stage her own revolt if we didn't eat lunch soon. Since the fort is located in the historic downtown area, we just walked across the street to see what we could grab for lunch. There are tons of options! Much like the night before, all the restaurants were crowded and had a crazy wait. So, the first one to be under an hour was the winner. Pizza Dina had pizza and a thirty minute wait so it was our winner. The hard part was they only had one pizza maker for a lot of pizzas. Thank goodness for iPhones and the Netflix app. The food was yummy though! After lunch we made our way around the little city for some quick shopping. The historic district is filled with so many adorable little boutiques and fun shops. I could have spent all day browsing around. Mr. Cute is probably thankful my Amex didn't get much of a chance to appear since the three kids quickly began to bore of this portion of our trip. Except for L.C. L.C. was ready to shop until she dropped. She was on a mission for a "beautiful dress, pretty jewelry, and some smelly stuff". Lots of shops had these hand made soaps and she was obsessed with them. The kids spotted the cutest little candy shop, and were fascinated with them making taffy. We walked inside and they told each child they could pick out one free piece. Needless to say we walked away with a little more than that. Once we were all good and sugared up, I took all that pending energy and headed us back to the hotel for some beach time. Thinking of all my friends and husband enjoying a nice relaxing time in Augusta for The Masters Tournament. The beach as always, was perfection. Really...can you have a bad day at the beach? The temps were only in the mid-seventies, but that didn't stop the kids from getting in the water. I dipped my toes in and froze to death. They had tons of fun digging in the sand, soaking in all the sunshine, and getting to run free. I'm not sure if St. Augustine Beach is always like this, but it wasn't nearly as crowded as I expected for Spring Break. Especially considering the amount of people we encountered at restaurants and in town. Or maybe we are just the crazy ones who feel like it was warm enough to hang out on the beach? Just before dinner time we tore ourselves away from the beach, and the kids saw the pool. They begged to swim, so I said to go ahead. If I thought the ocean was cold the pool was like a polar bear swim. I can't even believe they were willing to swim in it. I watched safely from my pool chair. Out of a potential splash zone. With a sweatshirt on over my cover up. I let them swim until they were blue and their teeth were in full on chatter mode. Then I ordered food from Sunset Grille across the street (attempt #2), and left them in the whirl pool tub with some bubbles and my sister supervising while I picked up food. I'm pretty sure they were in heaven. We ate our food in the hotel breakfast area/lobby because I wasn't about to wait to eat or have the kids up any later than they already were. I knew the meltdowns that would occur, and didn't think the good patrons of St. Augustine's beach side grill needed that in their life. It was laid back and easy. Just like the rest of our day was. Stay tuned for tomorrow and Day 3!